How to enthral the audience by your presentation so they leave the room feeling motivated and highly satisfied? Anyone who wants to learn this needs only two assets. Firstly: be an easy conversationalist in contacts involving two and more persons. Secondly: have the daring to render oneself vulnerable in contacts involving two and more persons. Sometimes I’m asked to train managers and entrepreneurs in the art of public speaking. They already know the stereotype approach and rules. For instance: 4 keywords in one slide, maximum 20 slides in one presentation, avoid reading, avoid ‘euhh’… We practice the basic principles and skills, which are relatively easy to teach. This involves a framework of body language, eye contact, breathing exercises, position on stage, using or not using a slideshow, handling a flipchart, audience interaction, language, intonation, pauses. How the participants manage this depends greatly on their personalities and preferences. The provided insights leave the participants eager to explore their ‘individual’ self and most of all to develop the daring to ‘go for it’. In this way one learns more quickly despite the (necessary) failures. It is mainly about learning to handle failure, fear, feedback, and… I may hope: applause. It is fundamentally about putting aside one’s ego and enthusiastically presenting one’s vulnerable strength to an ever-critical audience. You can’t please everyone but if you can enthral 80% of the audience that’s enough. No experience is required; everyone who can talk in intimate circles can learn this. Two prerequisites: will and daring. In the U.K. there is a real competition for young speakers by the BBC. Interesting stuff! 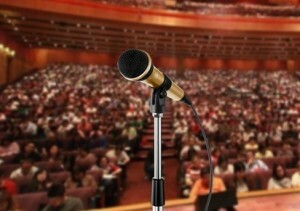 Get your free self scan about your presentation and speaking skills. It will take you only one minute to fill out. Contact me at wim@wimrombaut and you’ll receive the questionnaire for free. Mention Dutch or English.